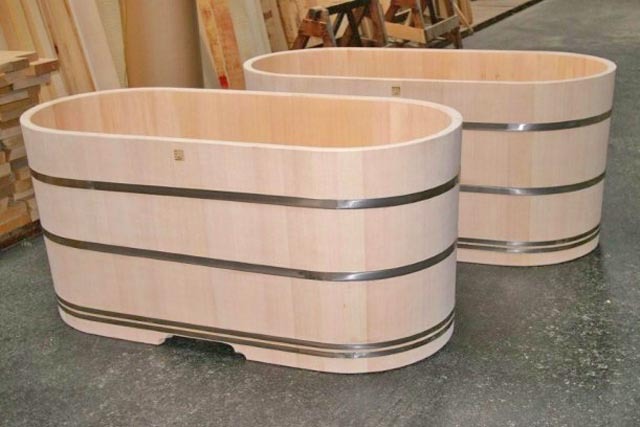 Custom tubs | Bartok design Co. 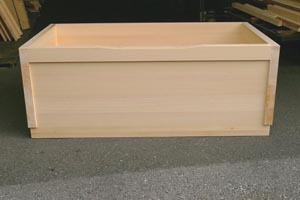 Custom tubs – Page 12 – Bartok design Co. 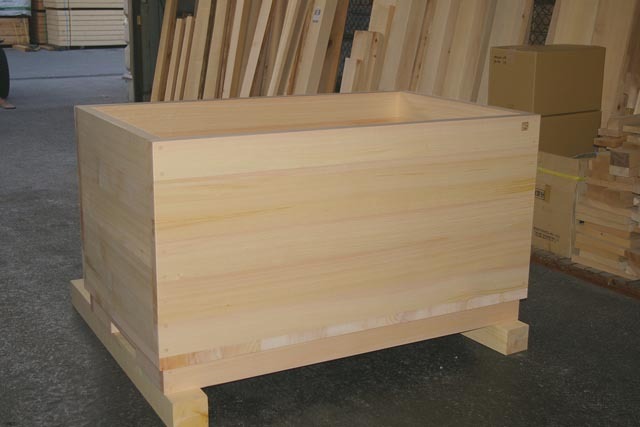 Here are twin oval-barrel shaped hinoki tubs – 1520 x 670 x H710mm (ext. dimensions). We used stainless steel bands to contain the water pressure. The client at first required copper bands, but it would be too weak so we proposed stainless braided wire which is solid and not too difficult to assemble. We reached the compromise with stainless steel bands: the look is very nice, but – boy – they had to be slowly hammered one by one from the bottom up and it took forever! 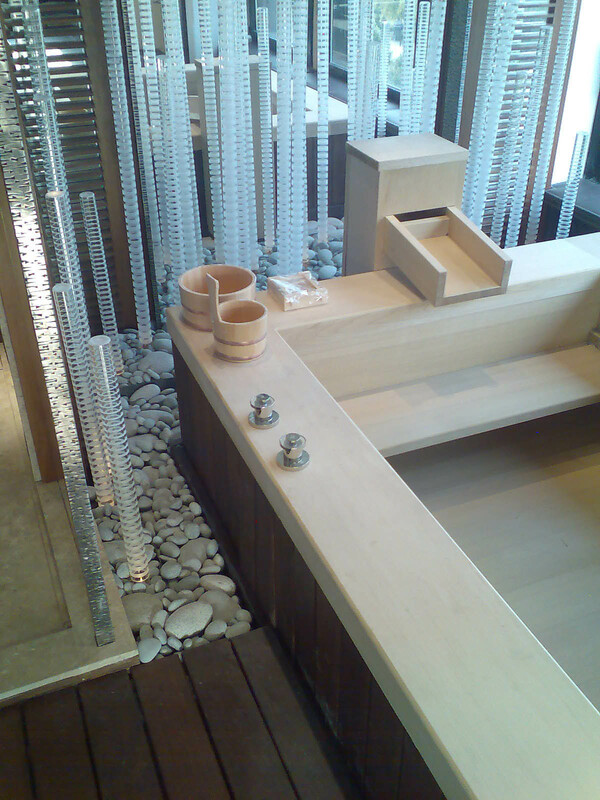 This tub was coordinated by a very talented and professional architecture office in Switzerland. 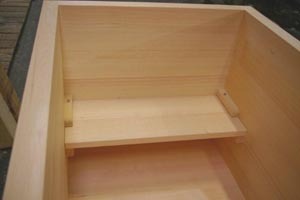 When we saw the drawings, there was just nothing to add or modify and we could start manufacture immediately. 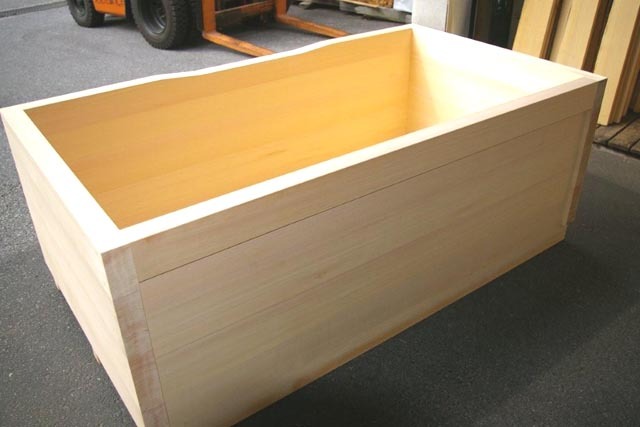 Without being huge, this tub has majestic proportions and we could keep the design simple by using a 50mm extra thick plank for the front instead of an otherwise neccessary top frame border. 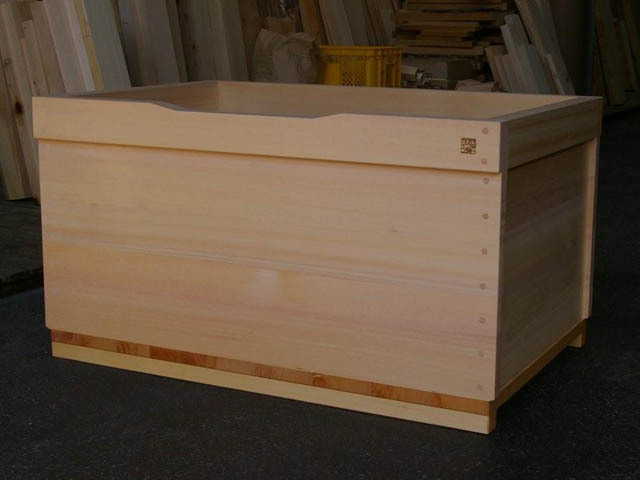 The tub is in knotless quarter cut hinoki (sizes L1570mm x W900mm x H685mm) and has an internal bench. 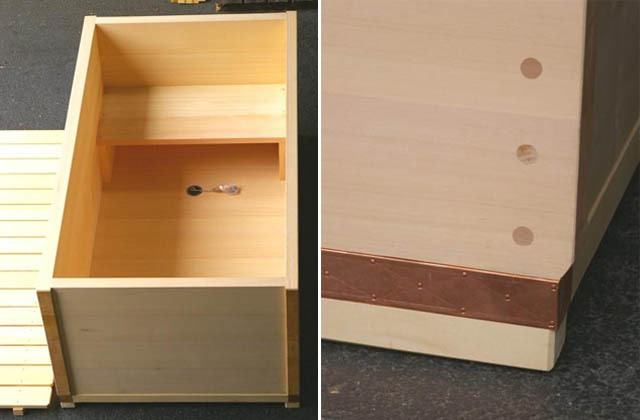 Note also the copper apron detail at front which furnishes extra protection to the head of the bottom planks, and is almost completely hidden by the floor duckboards. 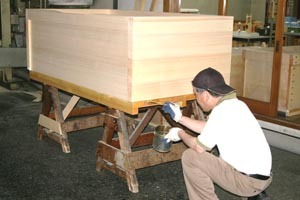 One nice thing about dealing with hinoki tubs is that they allow us to meet nice people! Be they professionals, musicians, journalists or slow chefs, they are all wonderful people. This was definately the case, and the preliminary phase was animated but surprisingly smooth. The tub was first switched to a different wall, rotated, adjusted. Everything in with few, energic movements as an experienced cook would sautee eggplants and zucchini. 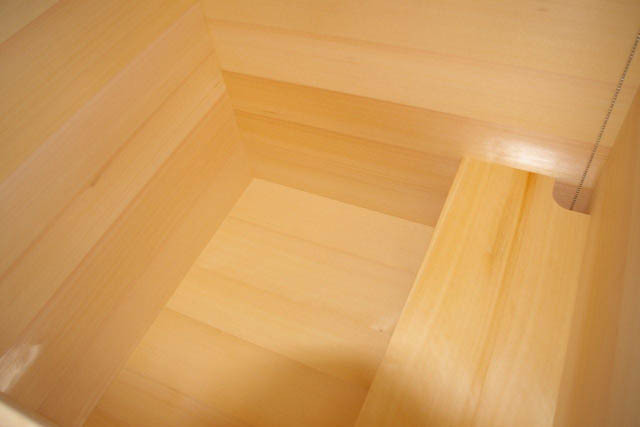 The tub L1200mm x W800mm x H660mm is in quarter-sawn hinoki – knotless grade and has a top border cut to redirect the overflow towards the adjoining shower. The picture does not fully convey the beauty and peculiarity of this tub! 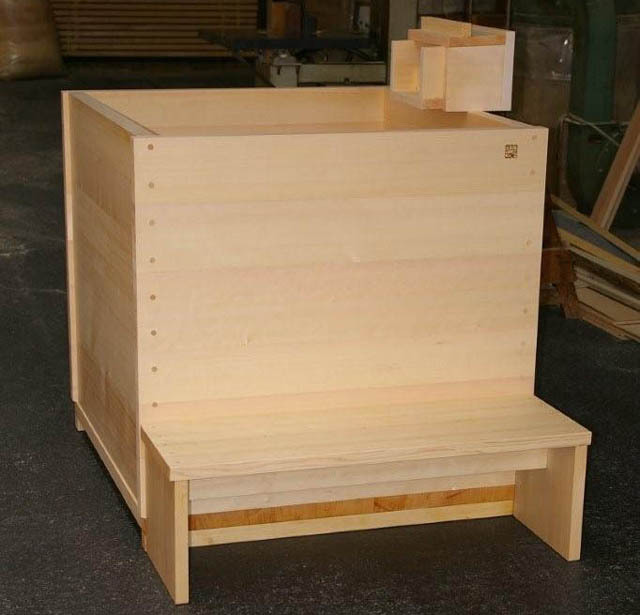 The request was a large tub L1800mm x W1000mm x H690mm (depth=600mm) but with the simplest – minimal detailing. 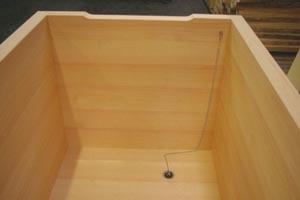 – as the tub is set against a free standing ledge with the faucet, in this case the short faces become the main side. 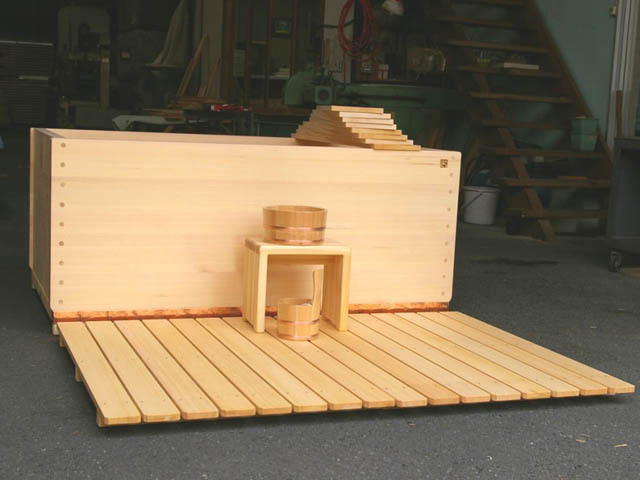 Other accessories include an japanese style tub cover and an outside bench in hinoki wood which can be used both as a step and for relaxing after the bath. and base area from humidity. We had the honour and the pleasure to deal with a top class construction company for this project. 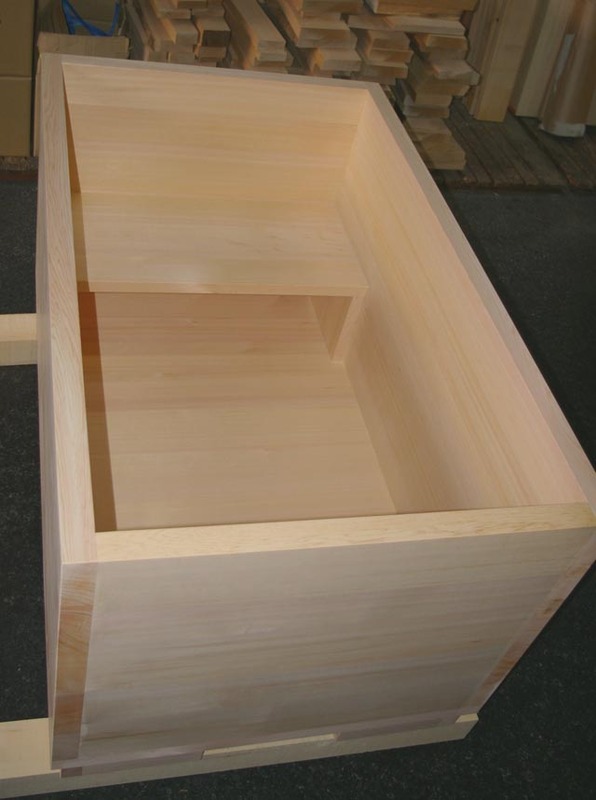 An extracomfortable L1560mm x W950mm x H845mm hinoki tub was designed and built to retain all the archetypical simplicity and grace of hinoki. 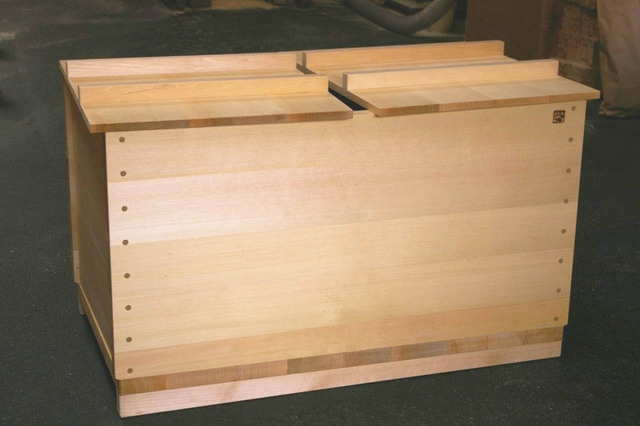 To obtain this box-like design we opted for an extra thick wall plank (50mm in place of the normal 35mm) and used only quarter sawn cut. This detail allowed us to do without the top frame border. 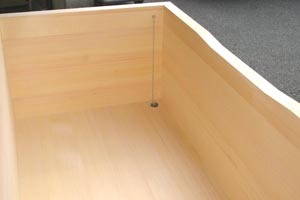 Also, the corners of the tub are simply “L” shaped in place of the traditional “T” shape (see picture below.) Of course this was possible only because of the thick plank which gives more structural stability and width to set the dowels. Waterproofing and protection of the side of plank in the joint is also assured with this detail. 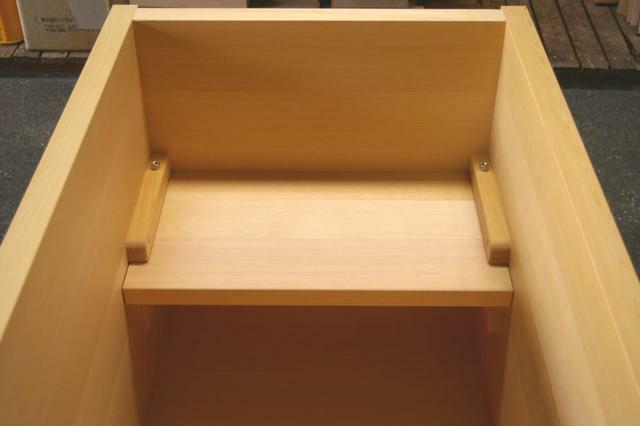 The architect office required us the bottom sleeper to be recessed like a base molding, to match the design of the rest of the room and cabinetry. I am looking forward to see this installed! We had some communication problem in the beginning because some mails were captured by the spam filter . 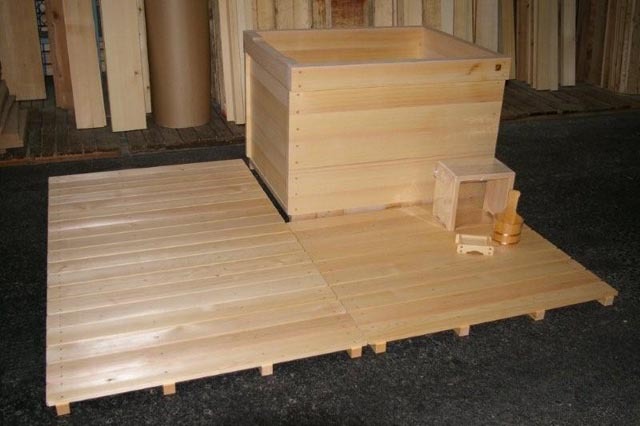 Anyway, once found the problem everything proceeded smoothly and we could ship this hinoki tub, custom size sunoko and accessories in record time. Every detail such as tub size adjusments, wall joint, floor duckboard modular units were agreed together with the client. 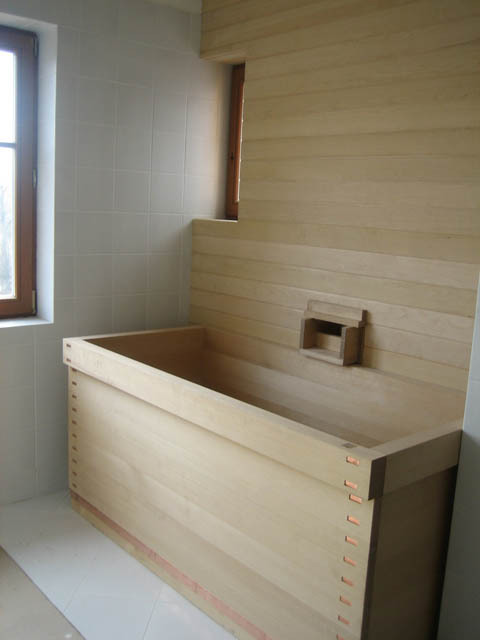 Our client was so kind to send us the photo of installed asnaro bathtub so we are glad to publish it here! The asnaro wood paneling creates a warm atmosphere, a kind of “other world”, a natural corner. I think the local contractor made a great job and the spout was partially recessed inside the wall as planned. 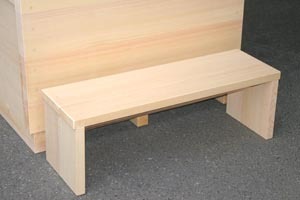 Afterall no matter how our cultures may be different, working with wood and loving wood is definately a common heritage.